It was time to step off the fast paced rollercoaster that is life, and reset the heart, the soul and the mind. 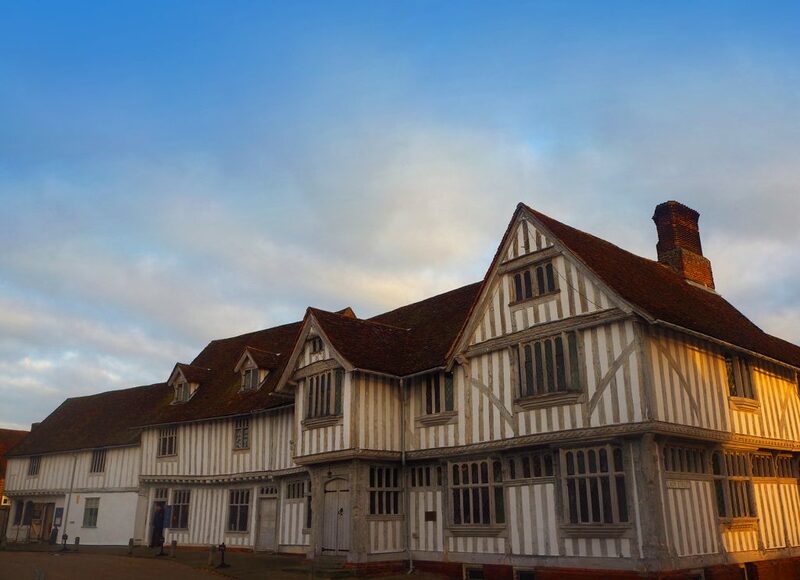 Rather than battling through an airport and jumping on an airplane to head to foreign climes Cheeky and I hopped in the car and took a short drive to Suffolk and the historical town of Lavenham. During the 15th and 16th centuries the town prospered from the Wool industry becoming the 14th richest town in England. 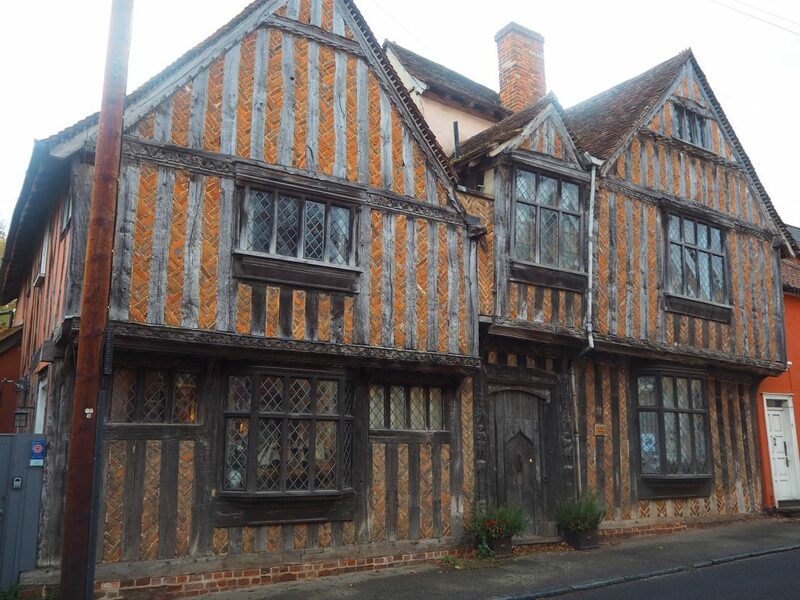 Sadly, poverty struck for about 300 years following this prosperity, which meant the poor folk of Lavenham could not update their houses or build new brick homes; luckily for us this means that Lavenham is possibly one of the most gorgeous historical towns in England. With classic Medieval wood framed buildings that have warped and become crooked over time, Lavenham now looks like a land that time forgot. Of all of these ancient buildings, we were lucky enough to be staying at The Swan at Lavenham Hotel and Spa; a hotel that covers three houses from as early as 1425. Entering the building through the front door from the high street, certainly feels like one is stepping back through time. Despite the modern comforts there is a deep sense of history here, from the gnarled oak beams, wattle and daub walls, small nooks and crannies and my favourite were the carvings and marks above the fireplace that were there to ward off witches and their apparent dark arts! The Hotel is a bit of a labyrinth with various corridors and passages leading here and there giving a sense of growth over many 100’s of years as the three houses were brought together and areas altered to make the hotel as it appears today. As we were to discover there are plenty of places to cosy up by the log fire and sip a hot Chocolate or an Espresso Martini. 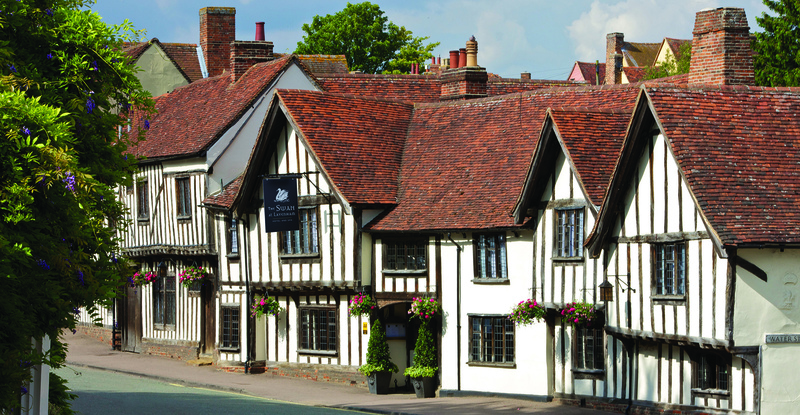 Once settled in, it was time to explore the village of Lavenham. Reputed to be the best preserved medieval village in England there are no less than 340 listed buildings, everyone of them unique! Cheeky being a huge fan of Harry Potter made sure that our first stop was De Vere house, the house that Harry’s parents lived in when Voldemort struck. If one did not know better then one would think that it was a purpose built film set. Following any of the adjacent streets uphill takes one to the Market Square, the bustling heart of the village where people have come for centuries to trade, meet friends or watch grisly public executions. It is certainly worth checking out the Corpus Christi Guildhall, one of the largest timber-framed buildings in the UK, stunning with its limed timbers it shines out like a beacon in the square. Also, check out Little Hall in the far corner, which looks like it had been dipped in Turmeric powder with its bright orange colouring. Walking the streets of Lavenham can bring on an appetite, but not like any ordinary appetite … the copious amount of tea shops will eventually ensnare you and before you can say ‘More tea vicar?’ you will find yourself sipping Earl Grey with lashings of freshly made scones and cake. 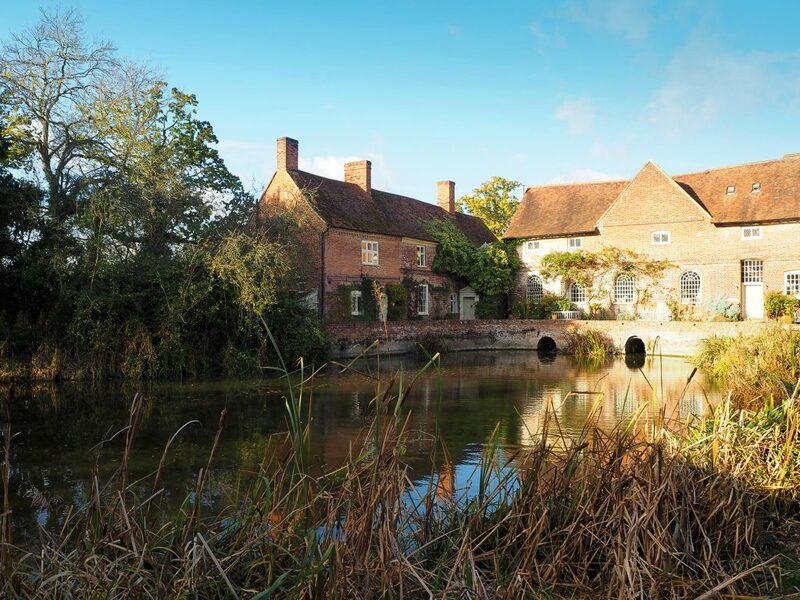 We can recommend the Munnings Tea Rooms at the Crooked House with its homemade cakes and gluten free selection, or perhaps Handmade at Hadleys for its delicious ice cream flavours. Eventually it was time to head back to our suite, to get ready for dinner in the AA Two Rosette Gallery restaurant. 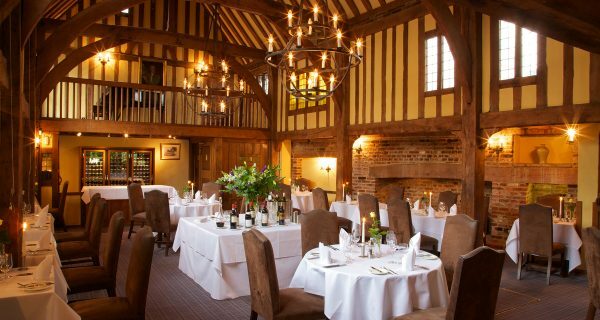 Once a stables for horses, the high timbered ceiling is now an exquisite warm space with huge fireplace and minstrel’s gallery; with lots of natural light the airy space was a pleasure to frequent for dinner and breakfast. The head chef Justin Kett has created a simple but high quality menu from the the best local ingredients that can be found. We nibbled on delightful homemade rosemary bread with whipped butter, whilst Zack our waiter brought us amuse bouche of humus on sesame biscuit and mackerel on toast with arancini ball. Cheeky opted for seasonal and very homely pumpkin with pappardelle pasta, whilst I ended up with the Pigeon and beetroot a very pretty as well as succulent dish. 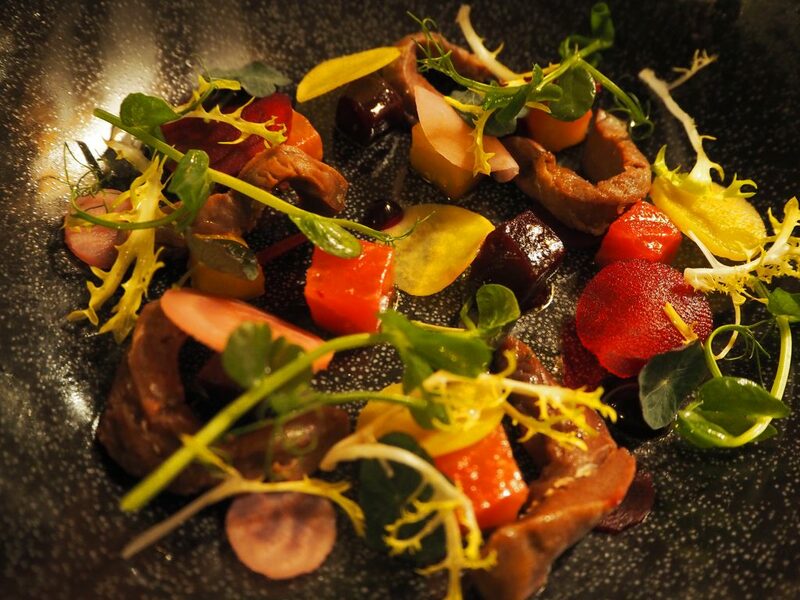 As our favourite meat, Cheeky and I opted for the Venison with parsnip, carrot, pomme puree and quince; the venison was perfectly cooked, tender and tasted more like a steak than the rich gamey taste that is often attributed to venison. Next we moved to the cheese course, a firm favourite with Cheeky, with classics such as Brie and Cheddar. For dessert we opted for the blackberry souffle with its beautifully fluffy texture and delicate apple sorbet on the side. In all the surroundings were perfect and the food most gratifying. 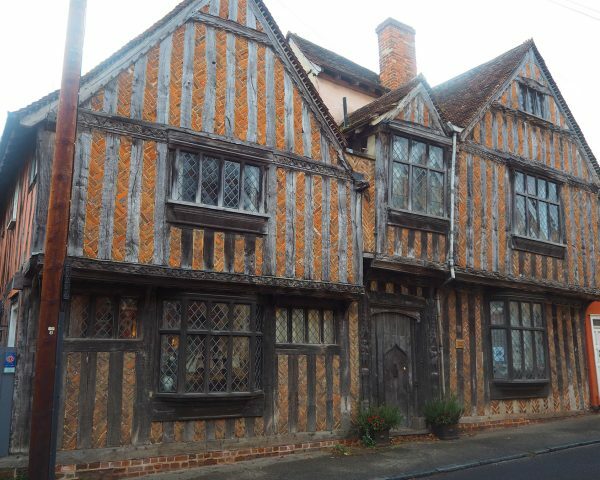 Aside from Lavenham, there is much to see in and around Suffolk. 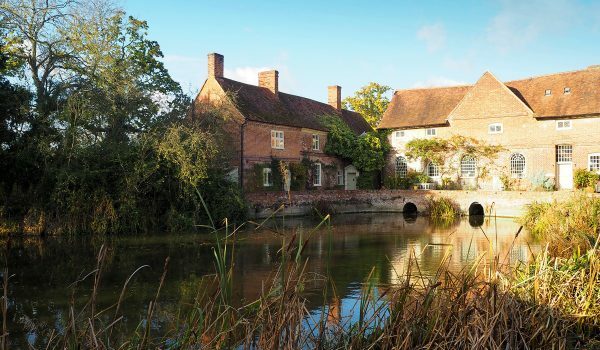 As a landscape artist myself, we had to drive to the hamlet of Flatford where John Constable painted many of his famous rural landscapes including ‘The Hay Wain’. One can position oneself at each of his painting spots and compare the landscape of Constable’s day to how appears today. This is obviously quite tiring, so more tea and scones were required help replace the calories burnt wandering Constable country. It was then over to Sudbury the home place of Thomas Gainsborough another local artist and an inspiration to Constable. We checked out Gainsborough’s House to see where he had lived, see his art and the plans for the new gallery exhibition. If willing to drive a little further, then for some ancient history of the English race, then head over to Sutton Hoo. The museum is built near to the giant burial ship mounds which released their secret treasure trove of Anglo-Saxon in 1939. The museum gives a fantastic insight of the incredible tribes who came together to make the English. After a fabulous day exploring Suffolk, It was time to head back to the Swan at Lavenham to experience the ‘French Classics’ Wine Story evening as prepared by Justin Kett and head Sommelier François Belin. We were to enjoy Canapes in the lounge area with a gorgeous 2015 Château Haut-Peyruguet Blanc to start the proceedings. 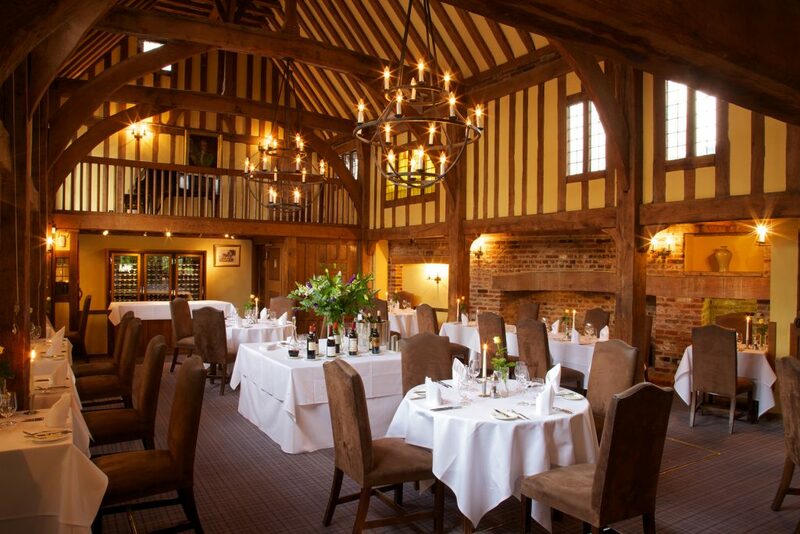 We were then escorted through to one of the private dining rooms, a high ceiling medieval space with large timber beams, tapestries on the walls and two large dining tables ready and waiting for us. 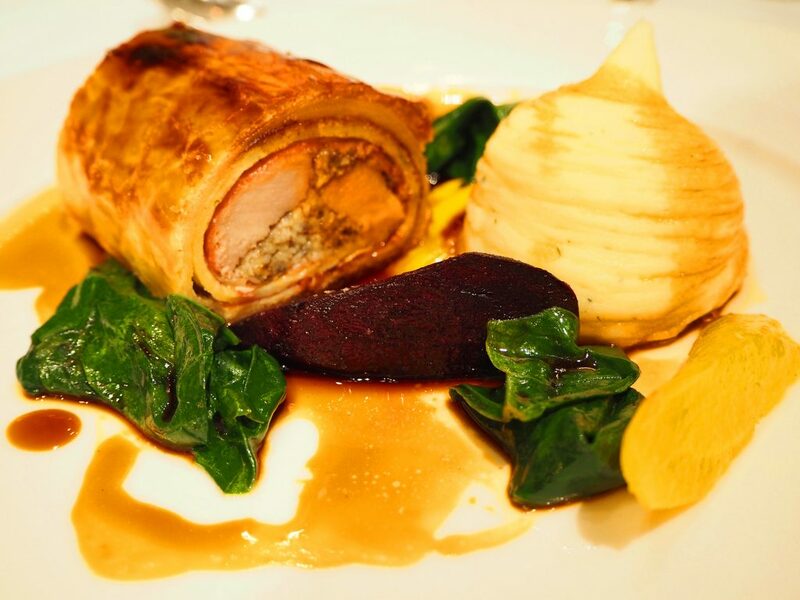 We made our way through four courses all paired with fine wine from various French regions. First we tucked into a fresh salmon aumônière with a 2016 Chablis Séguinot-Bordet, a fresh and clean wine with hints of watercress. As French evening, it would not go by without some frogs legs with roast garlic. The succulent, tender meat was served with 2014 Sancerre Reserve, Domaine Georges Millerioux, delivering rich golden colour with a snappy apple flavour made for pairing with garlic. 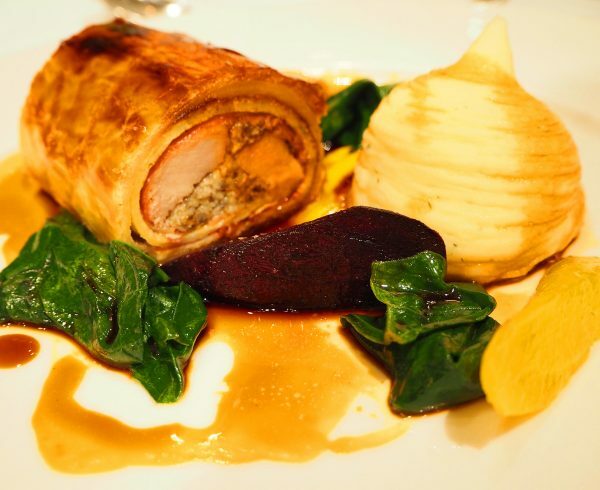 Main course arrived in the shape of Rabbit Wellington with carrot, pomme puree and Spinach complimented with a mature 1996 Châteauneuf du Pape ‘Cuvée Tradition’ and a 2001 Château Godeau, Saint-Emilion Grand Cru. The Châteauneuf du Pape was particularly delightful with its rich and smooth flavour due to its age. The evening was finished with a very delicious French Apple Tatin; this mouth watering dessert was accompanied by a Pineau Des Charentes Rose, fruity and sweet. When spending so much time travelling abroad, it is easy to forget that England has so much to offer in the way of culture, heritage and cuisine. Lavenham and the surrounding areas have all of these in spades; from the historic architecture, to the fabulous cakes and scones of the hundreds of tea-shops, from the artistic expressions of Constable and Gainsborough to the ancient beginnings of the English. 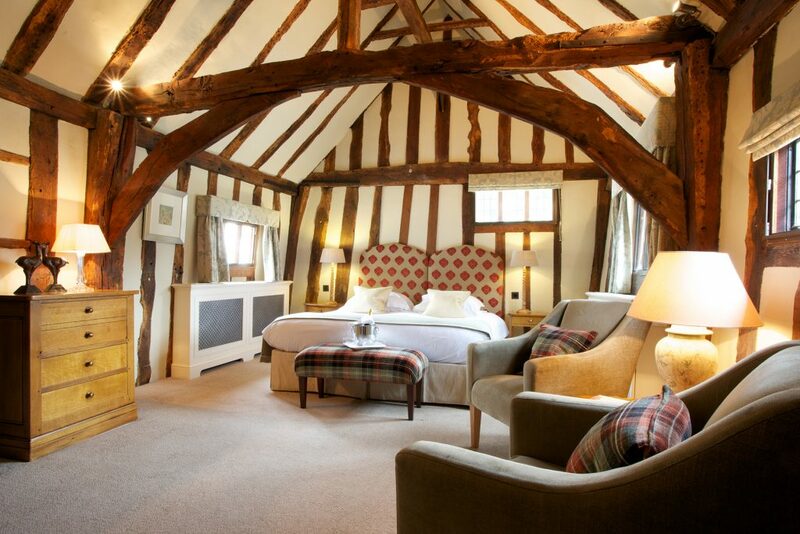 The Swan at Lavenham sits perfectly amongst all of this history and culture, when your day of exploring Suffolk finishes the cultural and gourmet experience does not stop there as Justin, François and the team are ready and waiting to deliver yet more gourmet delights in some of the finest historical surroundings.